Dumbbells are one of the best exercise equipment that you can get. What makes them great is that unlike other home gym equipment, they do not require confusing setups. They are also very sturdy so that you can use them for a long time so that you can train your muscles without constantly. You might think that all dumbbells look the same, but they are designed differently depending on their brands. Today, we will look into two brands of dumbbells to find out which one is the best. 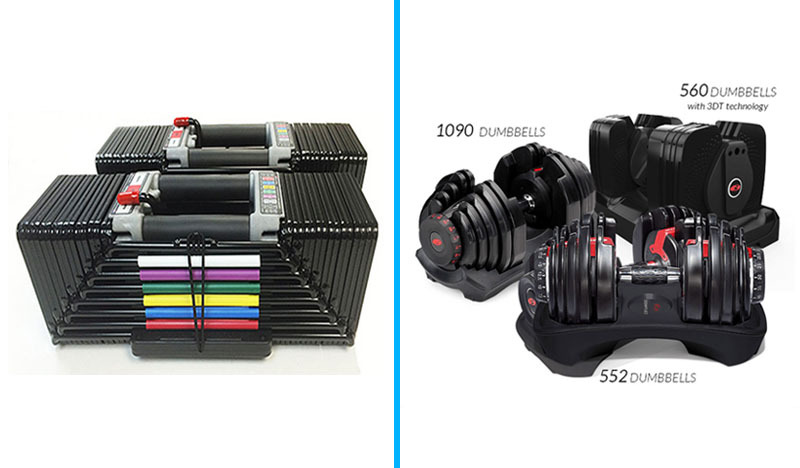 The Powerblock and Bowflex dumbbells are two most popular brands of adjustable dumbbells. To help you decide which dumbbell to get, then let this unbiased review spread the facts in front of you so that you can make the right decision on which dumbbell to purchase. 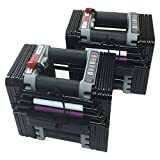 5 Should I Buy The Powerblock or Bowflex? 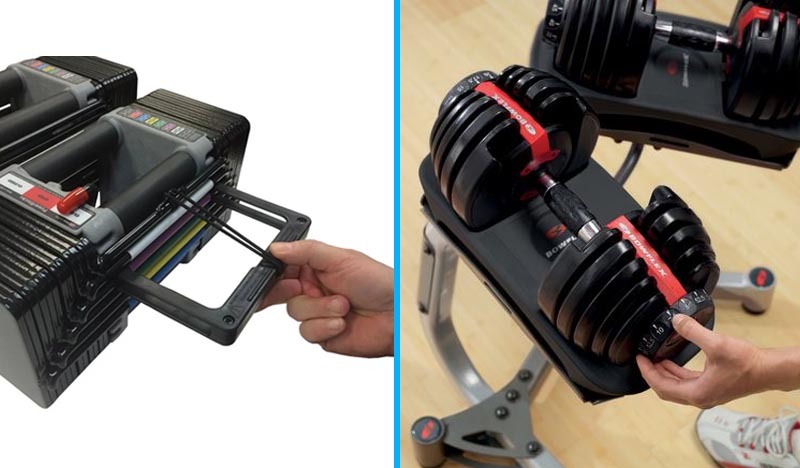 Powerblock and Bowflex are two giants which have capitalized on the adjustable dumbbell market each with their own benefits and drawbacks. The issue with a lot of home-gym equipment is that it can be confusing to set up and then when you finally do, it breaks after just a few uses. The frustrating thing about the world of fitness equipment at the minute is that it’s hard to tell what’s worth your money and what’s just good marketing. 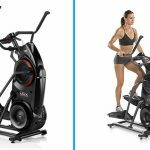 Thankfully, both Powerblock and Bowflex are offering high-quality, simple equipment that you can purchase right now to help you reach your fitness goals. Powerblock have stuck to a formula that works, rarely changing their equipment and instead sticking to the tried and true method. The dumbbells look extremely different to normal dumbbells as instead of one handle with two round weights at the end, the weights are actually square and the handle is almost enclosed around the weight. This can make it tricky to pick up for some exercises but the square design stops them from rolling away. To adjust the dumbbell you essentially just have to stick a pin into the weights that you want, much like a machine. You would then dock them back into the weights in order to reselect your next weight. Simple, easy, and straightforward. If you had to pick one, then Bowflex are most likely the top brand in the adjustable dumbbell market. Bowflex is sporting a more traditional and ergonomic design with the handle in the middle and several sets of round weights on either side. They come with a dial at the end of each set of weights so that you can easily switch between weights as and when needed. 552 – 5 to 52.5 lbs. 1090 – 10 to 90 lbs. To adjust the weights on a Bowflex you just have to use the built-in dial on either side which is actually quicker than the Powerblock option. Per hand, the Powerblock adjustable dumbbells can be adjusted from 5 to 45 pounds. You can adjust them in 5-pound increments. 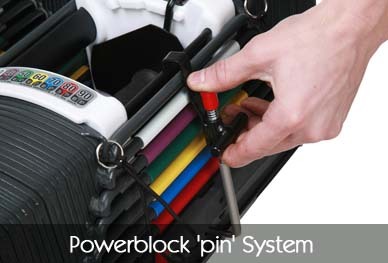 As far as the weight changing system is concerned, Powerblock uses a ‘pin’ system. Because of this, you can quickly change the amount of weight according to your needs. Bowflex adjustable dumbbells combine 15 weight sets in a unique dial system. Each dumbbell can be adjusted from 5 to 52.5 pounds. You can adjust them in 2.5-pound increments. 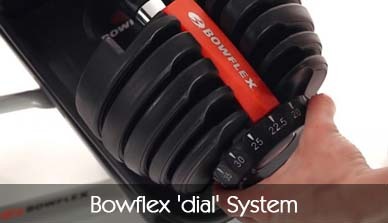 When it comes to weight changing system, Bowflex uses a ‘dial’ system. It makes it simple to change weight gradually according to your specific requirements. 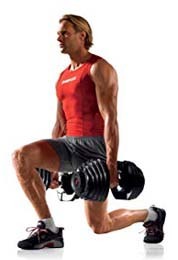 Both Powerblock and Bowflex make dumbbells with the materials that are high quality and durable. Powerblock uses metal for the weight plates which is black powder coat painted. Bowflex, on the other hand, uses arduous metallic which is covered in sturdy onerous plastic. In terms of overall quality and durability, both brands are on par with each other. Both brands also use plastic elements in the design, however, it has no significant drawback. The design of Powerblock adjustable dumbbells is not only ergonomic, it also ensures maximum safety. The selector pin their dumbbells use is magnetic, which is very helpful when it comes to holding it safely in place. There is also an elastic band, which is a good backup measure. The padded handle featured in these dumbbells helps to protect your wrists from injury. 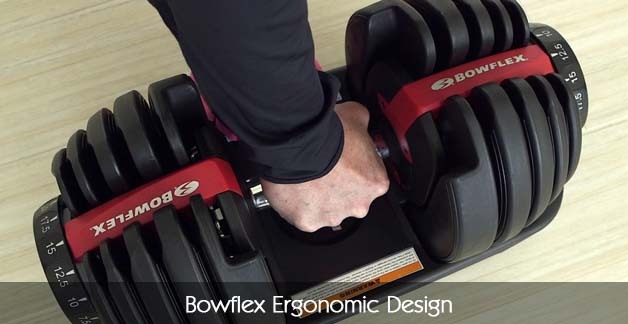 The handles of Bowflex adjustable dumbbells have an excellent ergonomic shape. They are relatively thicker in the center as compared to the edges near the weights. Their unique design allows for a better, firmer grip. The high quality of Bowflex’s weight-changing mechanism makes them highly safe to use. The weight plates themselves ensure safety as they are held securely by metal tabs. Powerblock dumbbells look different than most traditional dumbbells available on the market. They look more futuristic and unconventional. They are quite compact which makes them space-friendly, allowing you to easily store them anywhere. They have a cuboid, blocky shape, but that doesn’t affect their functionality as they perform great for exercises. When you compare Bowflex adjustable dumbbells with Powerblock’s, it is quite clear that Bowflex dumbbells are relatively larger in size. They have a traditional look but they are quite sleek and aesthetically pleasing. The company offers various models, but most are simply down to the weights you’re looking for, so there’s no reason to get confused over which you should go for. 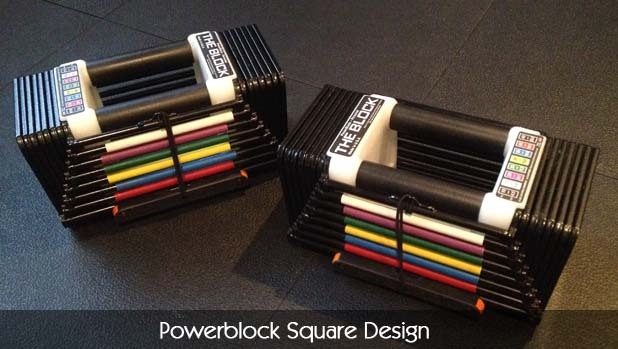 Closed Cage Handle Design – Powerblock dumbbells have closed cage design handles. These handles help reduce the chances of a wrist injury during a workout session. Quality Parts – The Power Block dumbbells are constructed using high-quality steel that is easy to grip and use. The dumbbells are built to help you concentrate on your workout instead of focusing on gripping them. Reliability – Although they may appear clanky when you begin to use them, as time goes on, they’ll prove to be reliable and stable. Bowflex carries a big name in the fitness industry. A lot of their equipment is extremely interesting and different with wacky and innovative designs which to those not in the know can seem fantastic. High Levels Of Adjustable Resistance – The lightweight model of Bowflex which is the Bowflex 552 has 15 levels of adjustable resistance. This assures you a full range of dumbbells in just a set. Steady Weight Adjustment – Bowflex adjustable dumbbells typically come with a 2.5-pound weight increment, especially for the first 25 pounds. This lets you progress at a steady level of your choice. Functional Adjustment System – Bowflex dumbbells are extremely easy to adjust. Just select a weight of your choice on both sides and lift. It’s simple as that. The effective adjustment system lets you keep exercising without disrupting your tempo. The plates of Powerblock dumbbells tend to stick together when you try changing the weights. Powerblock may also be quite uncomfortable for people with larger hands. The 90 pounds maximum weight may become an issue for some heavy lifters. The Powerblock and Bowflex dumbbells each have their own advantages and disadvantages. Based on the comparison chart, you might think that the Bowflex is better than the Powerblock dumbbells because it has more weight options and subtle increments. 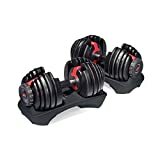 But you have to take note that while the weight options and small increment are the best features of the Bowflex dumbbells, the selling point of the Powerblock dumbbells is its intuitive and practical cubic weights. The Bowflex dumbbells have more varied weight options from 5 to 52.5 pounds. It also has a subtle increment of 2.5 pounds, so you can choose the weight that you want without putting too much strain on your upper body. This is a great option, especially among beginner fitness enthusiasts. Because of its small increments, it can be used by the entire family. But it is important to take note that the Powerblock dumbbells have options from 5 to 45 pounds. However, it can only be adjusted at 5 pounds increment thus it does not provide a subtle increase in weight. When it comes to the practicality of the design, we will recommend the Powerblock dumbbells as the weights come with the innovative cubic design. This gives more stability to the users as the weights have stable ends that sit perfectly on the legs as you lift them. But if what you want is a comfortable dumbbell, the Bowflex dumbbells comes with very comfortable handlebars thus it can reduce the risk for wrist injuries. I am scared of using weights because the plates might fall off. Which one offers better safety features? To answer this question in a straight-forward manner, both dumbbells come with different types of safety features. While the Powerblock dumbbells come with an elastic band to hold the weights in place, the Bowflex dumbbells come with metal tabs to hold the weight plates securely in place. Should I Buy The Powerblock or Bowflex? You prefer selector pins overweight dials. You are more comfortable with the flat and stable ends which sit perfectly on the legs before lifting. You are looking for more durable adjustable dumbbells. The Powerblock is quite resistant to wear and tear. You are now convinced that you’re a pro and should, therefore, begin to lift heavier weights. You want to enjoy up to 10 year home use warranty. You prefer the dial system of weight adjustment. You are looking for dumbbells with very comfortable handlebars. You don’t have a lot of space in your home. You want a set of adjustable dumbbells that can be used by every member of the family. You like adjustable dumbbells with an aesthetic design that would fit your home. Both brands of adjustable dumbbells are ideal for homes or gyms. However, when comparing the features and the value for money, our verdict goes to the Bowflex dumbbells because of their versatility and flexibility. They can be used by different types of fitness enthusiasts at whatever level they may be. But although this may be the case, we still think that the Powerblock dumbbells will also give you a bang for your buck especially if you take into consideration its practical cubic weights, material, and space-saving feature. Again, what you choose largely depends on your preferences. We hope that this review will help you make the right decisions.